Getting there: Take I-75 exit 279, go north on Old 27 past first traffic light about a mile up. Look for Commerce Rd, on the right. There are two banks on each corner of the street. Turn right, the parking lot is at the end of the road. Hint: it's behind the K-Mart. What's there: Aspen Park is a year-round park featuring 100 acres of woods, paved and unpaved trails, tennis courts and some of the best scenery in Northern Michigan. Aspen Park, with its nearly two miles of paved trails, is used in the summer by bikers, hikers, and skaters enjoying the natural wonders of this gently rolling wooded terrain. 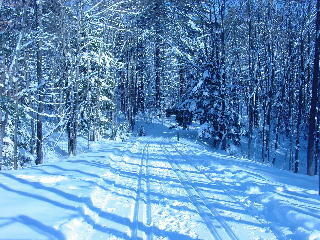 In the winter, expertly groomed cross-country ski trails that range in degree of difficulty from beginner to intermediate provide the cross-country ski enthusiast an opportunity to journey through both hilly and wooded areas with two miles of trails lighted for night skiing. Aspen Park is open everyday (including weekends and holidays) from 6:00 am to 11:00 pm. Trail lights are on daily from 6:00 am until 8:00 am and then again from 5:00 pm until 11:00 pm.